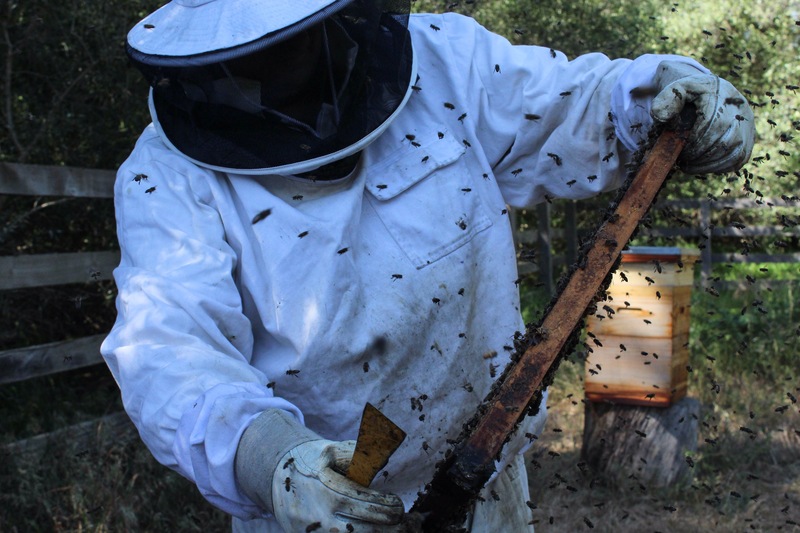 Did you know, the reason beekeepers overalls are white is that bees can’t see white? This is according to the renowned bee researcher at the Agricultural Research Council, Mike Allsopp. This is only but a few facts and wisdom that Mike generously imparted upon us. 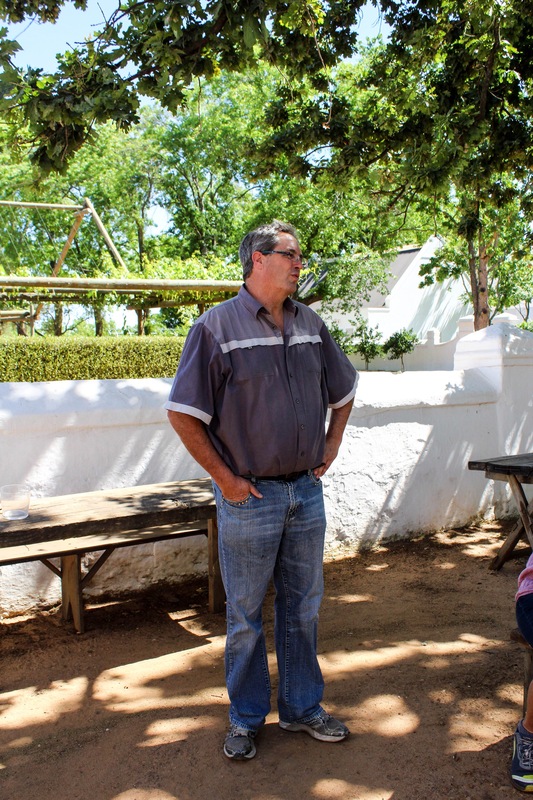 The Secret Life of Bees workshop was held at the picturesque farm, Babylonstoren in Simondium about 40 minutes outside of Cape Town. 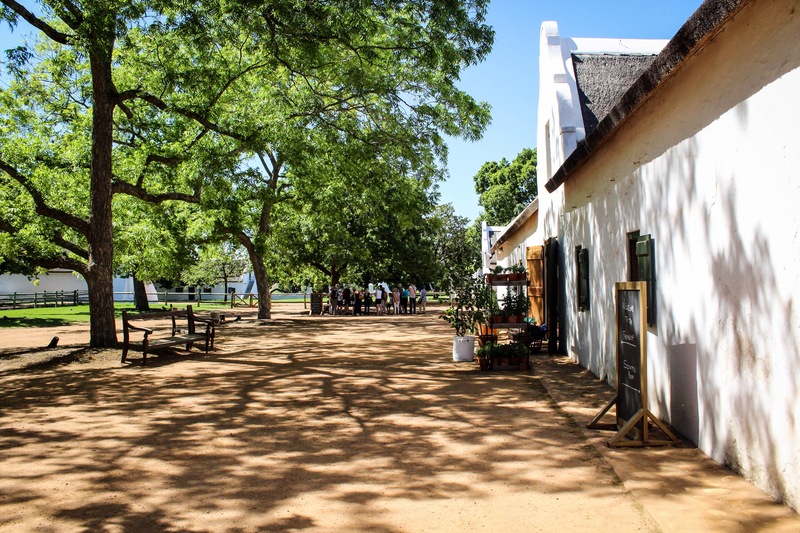 Apart from staying at their 5 star luxury farm hotel, Visitors can walk about in their lush and exotic gardens and thereafter have a rustic farm fresh lunch at the Greenhouse or if you’re looking for more of a trendier farm to table experience, Babel is the place to dine! 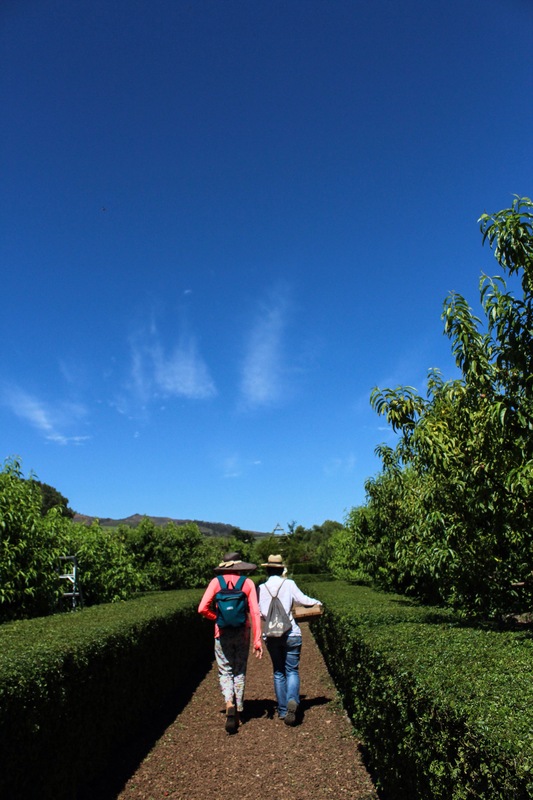 What was probably one of the hottest days of the year so far, the workshop started off with a walk through the gardens towards the farm loft where Q&A’s and a very insightful talk by Mike had us buzzing(excuse the pun)with insight and excitement. 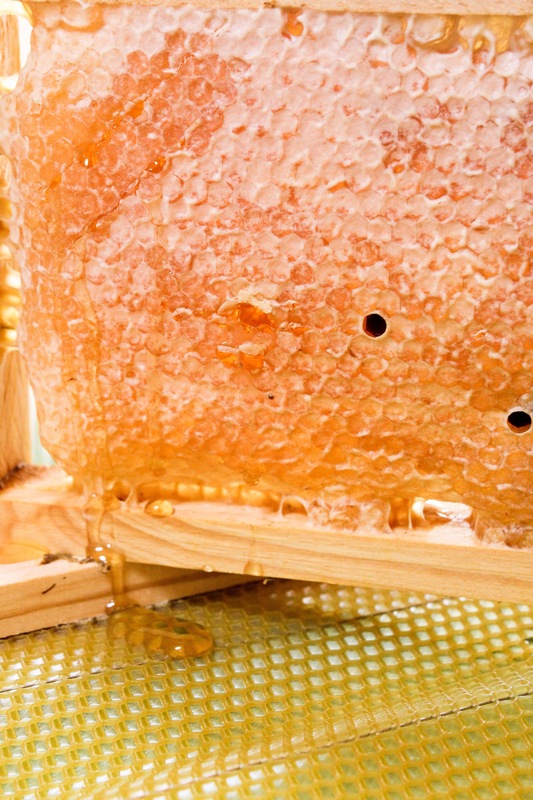 Here’s another fun fact, honey is a 50/50 mixture of glucose and fructose and only adult bees feed on honey. Under usual circumstances and normal temperatures, the workshop starts off with attendees going to the apiary first, but at 32 degree weather at 11:00 am it was advisable we visit the on-site apiary last. 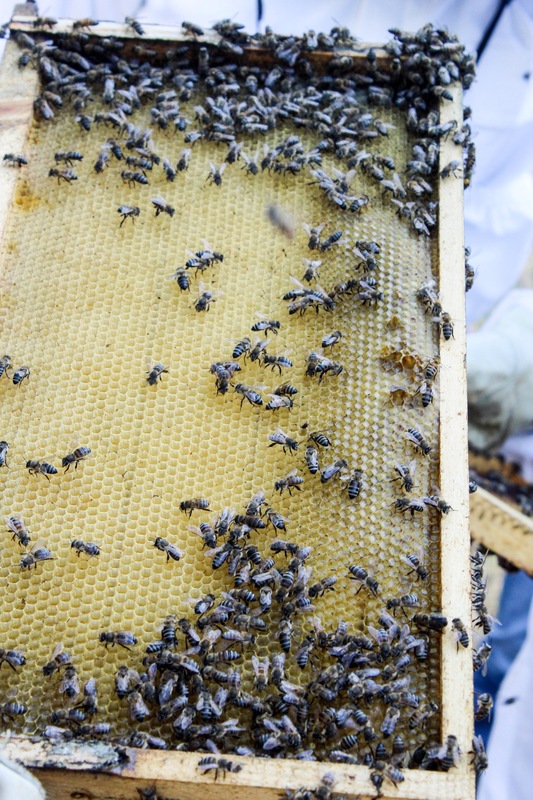 There are a few beekeeping methods, such as the Top bar beekeeping,the non-movable frame colonies and the extraction beekeeping methods.The most recommended is the extraction method which requires re-use of frames and the addition of honey chambers to increase production. 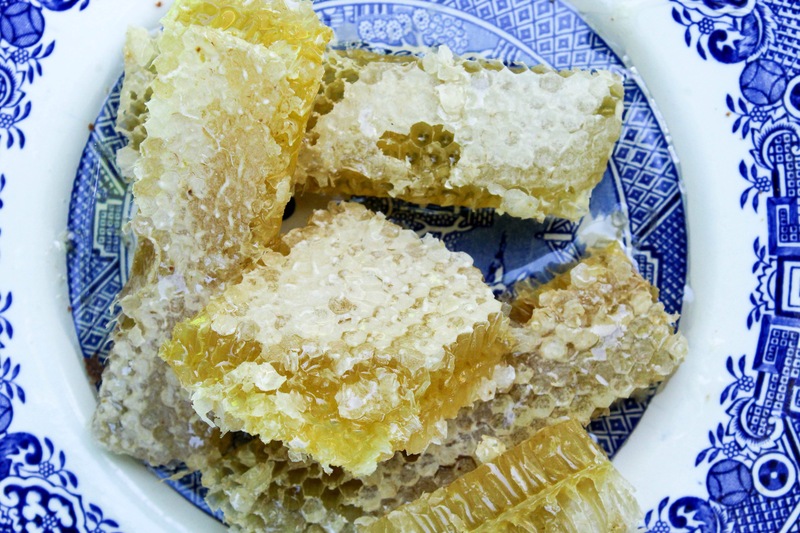 There are many types of extraction methods too, and the most widely used is Langstroth type of hives. 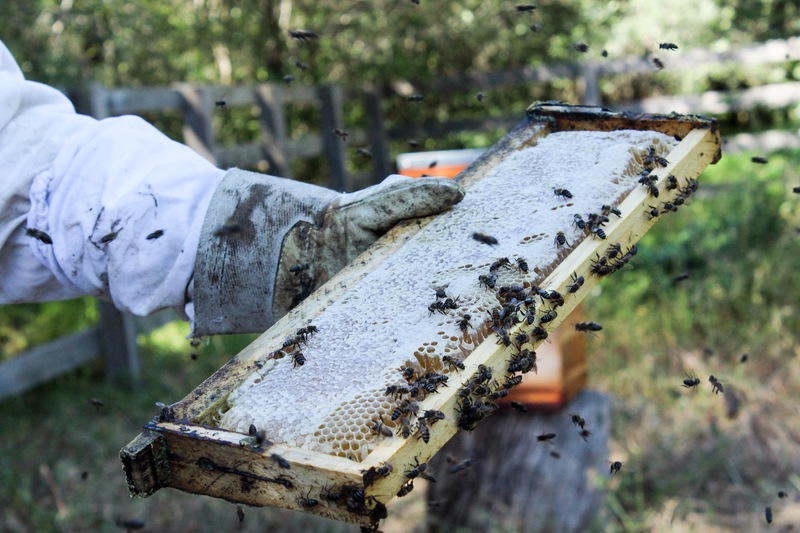 One will notice that on most of the hives we see today, it is fitted with aluminium tops, this is to ensure insulation of temperature and to keep the hive and bees cool. At 37 degrees Celsius, the hive is at a normal temperature, anything above this is far too hot for the bees. The worker bees are all female and have a life expectancy of 20-45 days, the worker bees are responsible for all hive activities. 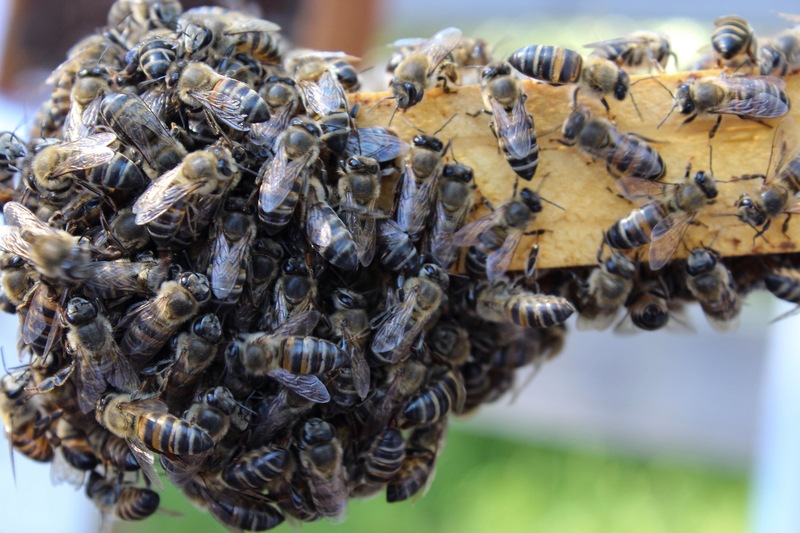 The queen bees are also female, and in every colony exists only one queen. The queen bee starts mating at a precocious age of only 3-4 days old. 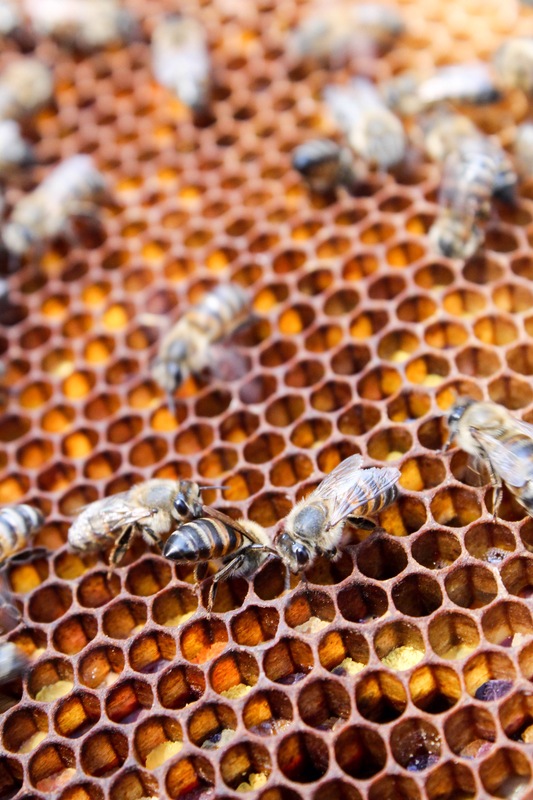 How is a queen bee formed? 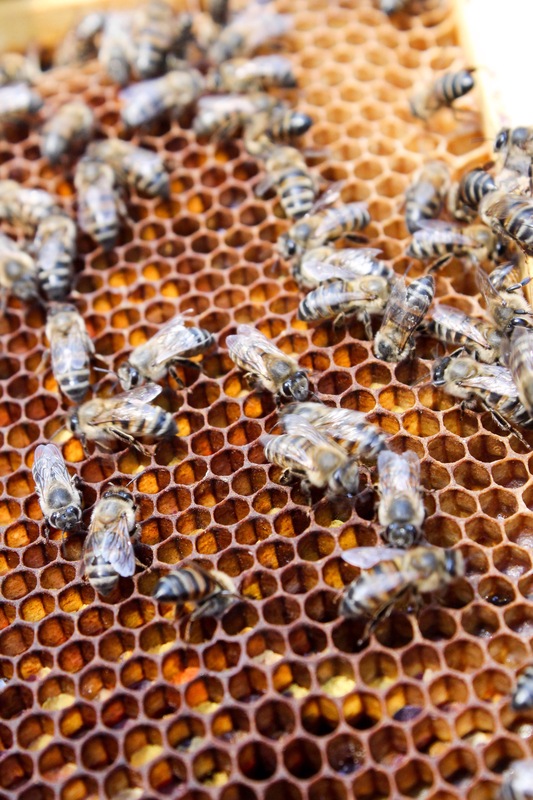 Baby larvae is fed Royal jelly, which then develops into a queen bee. The incubation period for a queen bee is approximately 14 days, a normal worker bee, 18-21 days, and a drone cell 24 days. The mere purpose of a drone is to mate with a queen and thereafter immediately dies. Honey is ripened nectar for the adult bees as said above, wax is synthesized by the bees and for every 8g of honey there is 1g of wax. Propolis, termed by Mike as ‘Bee Glue’ originates from plant resin and bees use it to stick to everything, close gaps and has antibiotic properties for the bees. However, there seems to be a common misconception according to Mike, that there is a trend specifically in health stores that it has tremendous health benefits to humans, this he says is false. After picking Mike’s brain about all things bees, we headed out to the Greenhouse for an aesthetically appealing lunch, the curried beef, lentil and waterblommetjie pie served was delicious and filing but a tad heavy for that day’s unforgiving heat, but the refreshments on hand, such as their homemade lemonade and iced tea was beyond heavenly, bursting with so much flavour.Using only what is on the farm, the cordials used in the iced tea and lemonade can be purchased at the Farm shop, something I wished I had done before I left to go home! On the table was a platter of freshly gathered seasonal vegetables of which a light and crisp salad was served on the side and as an extra special touch a plate of actual honeycomb with freshly baked bread on the side. 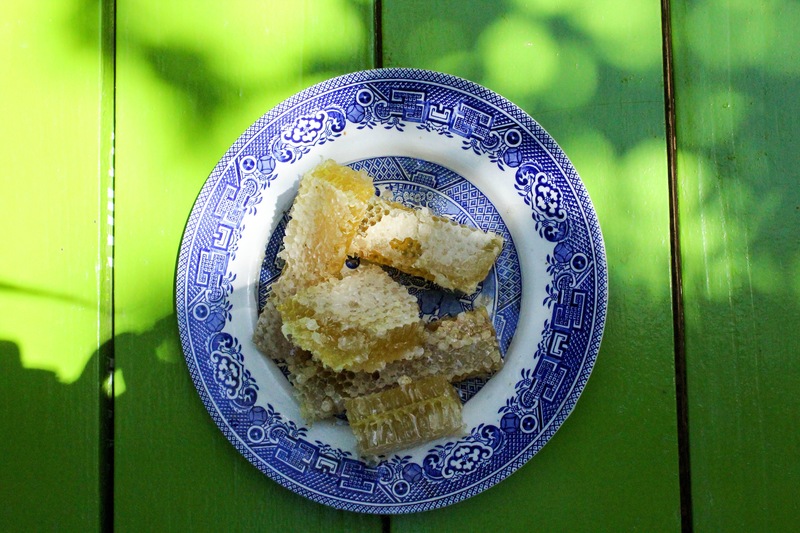 I think this was the very first time I ate honeycomb, and what a treat it was! Going back to the loft we all had to be kitted out in beekeeping suits, all suits had to be baggy enough, so the bees couldn’t easily sting us through the suit if it were too tight. Ankles had to be covered up as well, so I brought along my rain boots as recommended by Liesl and Mike. 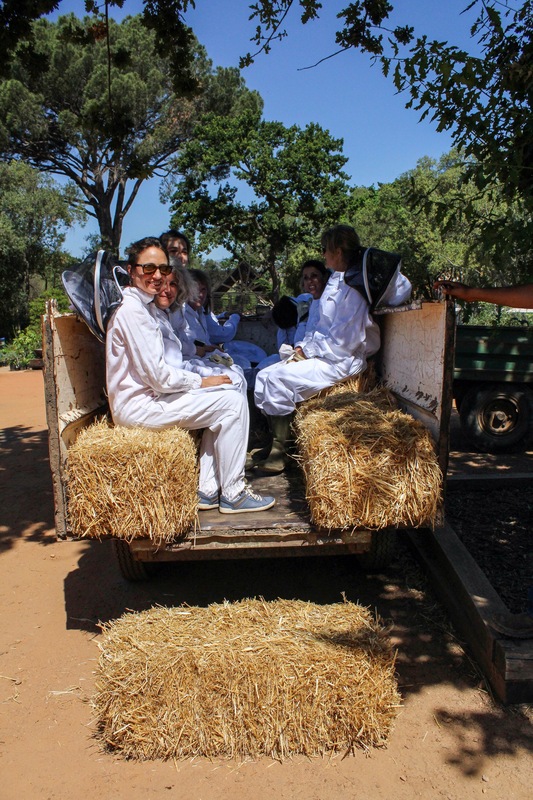 Kitted out and on the back of a truck with hay bales we sat on and admired the scenery as we were chauffeured to the apiary which was about 2km’s from the farm on the same property. Once there, Mike lit the handheld smoker and gave us a run down of do’s and don’ts when lighting the smoker. Tip number 1: Always ensure the smoke that the smoker emits is cool enough, demonstrated by blowing the smoke on your wrist or hand, if it is cool enough for you, then it is safe enough for the bees. Like all things to do with fire, never leave the smoker unattended, this has been done in the past and has been reported to have burned down property, vegetation and even harm/kill the bees. 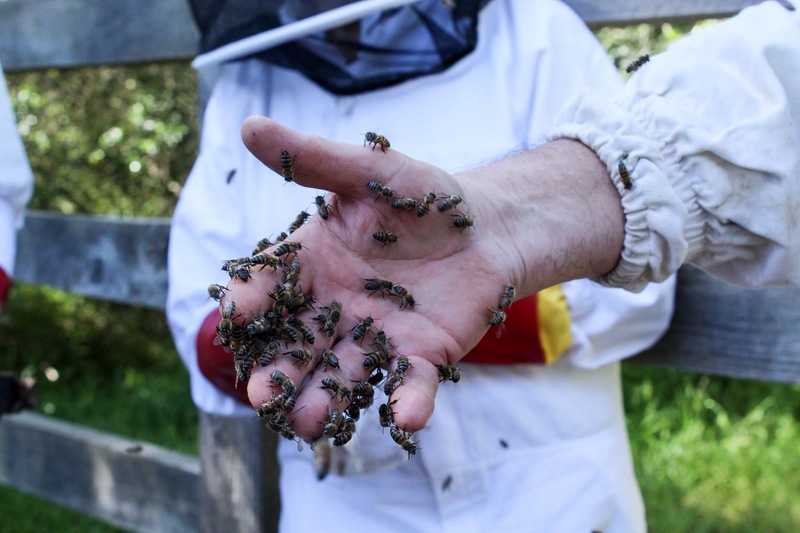 Mike’s hand full of calm and slightly sedated bees. Not to be attempted at home. 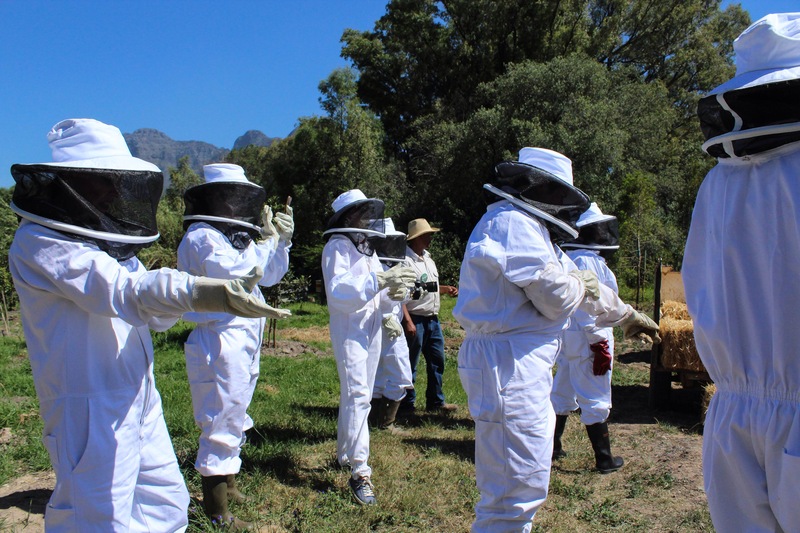 Heading into the apiary is quite an experience for the avid bee lover or for someone who wants to get over their fear of bees. 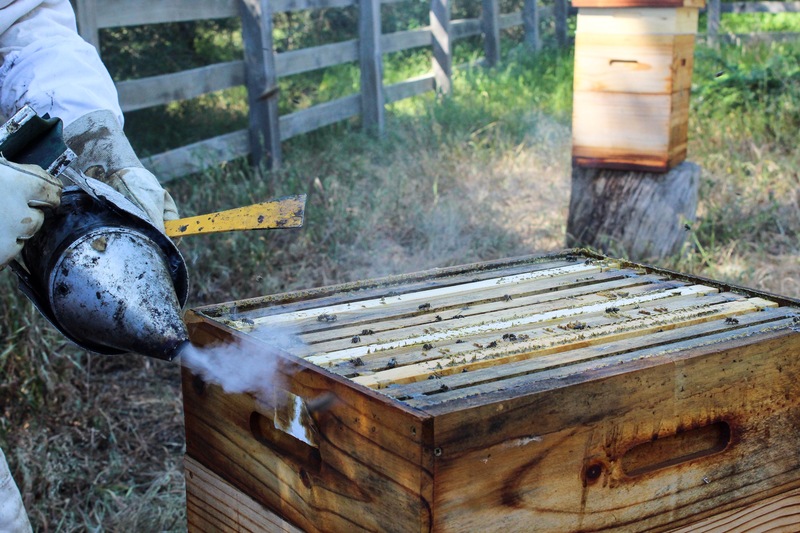 The first hive that was opened was rather nervous, but after a few puffs of calming smoke, all was well and the bees seemed a lot more hospitable from the second and third hive. A few of things we spotted was a queen right at the bottom of a hive in a corner, where she would usually be, a worker bee being born, and a few bees feeding. The late afternoon heat was unforgiving and many of us were spent by the time we went to the apiary, but for most of us it will be an experience we will never forget! 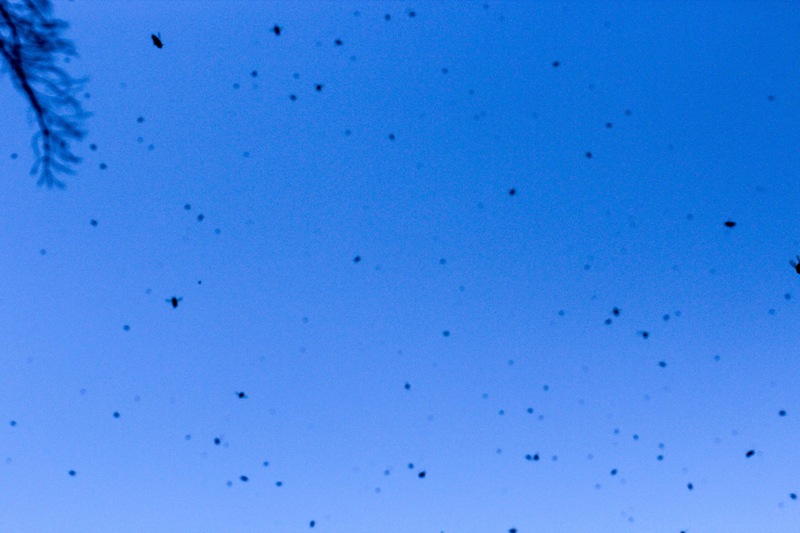 Blue skies with a chance of bees! The workshops take place annually, hosting only two in October, as this is the most convenient time, so as to not disturb the bees or their habitat. I would strongly recommend this insightful workshop to any avid or potential beekeepers, anyone who, like me is passionate about food or anyone looking for more information about bees with a sensory experience and meeting like minded individuals as an added bonus. 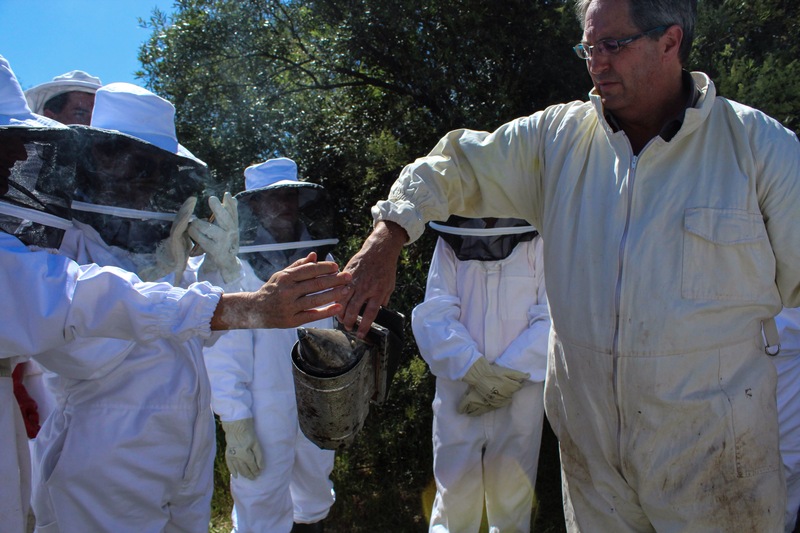 A sensory and educational experience it certainly was, I have gained so much insight into bees, their lifestyles, threats against them and their habitats. I definitely have more of an appreciation for bees now more than ever. I look forward to sharing my next adventure with you! Aubergine fries with a honey balsamic drizzle. Thanks for the support and for stopping by Milo! Hiya, I’m really glad I have found this information. 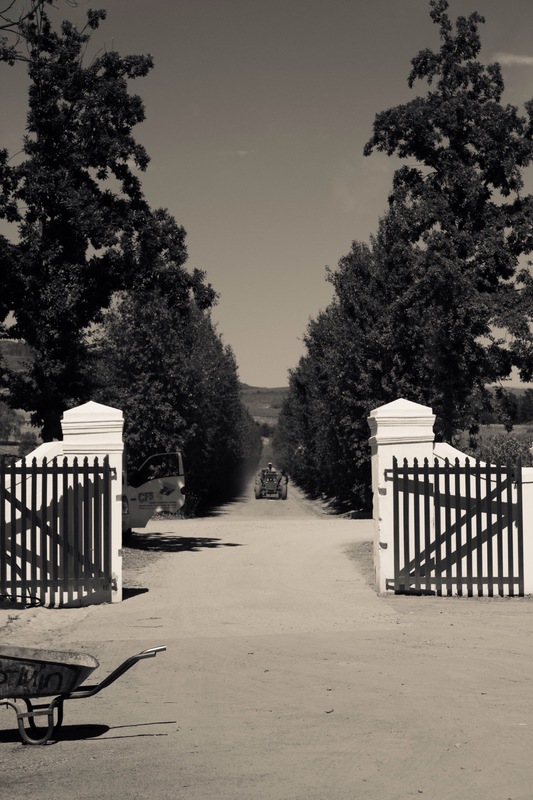 Today bloggers publish only about gossip and web stuff and this is really frustrating. A good blog with exciting content, that is what I need. Thanks for making this site, and I’ll be visiting again. Do you do newsletters by email?